Growing up near the Pacific coast, my fascination with tide pools dates back to childhood vacations on the ocean. There is an entire ecosystem in each little puddle and pool. Sea stars, anemomes, mussels and barnacles share habitat on Rialto Beach. Photo by Halfcenturyhiker. Sea stars (aka starfish) usually have 5 arms, but sometimes we’d find sea stars with a many more arms than that. The many colored sea anemones look like strange plants, but are actually animals that attach themselves to rocks and shells. They wave their tentacles when the tide is in and close up when the tide is out. If you accidentally step on one, it will squirt water! 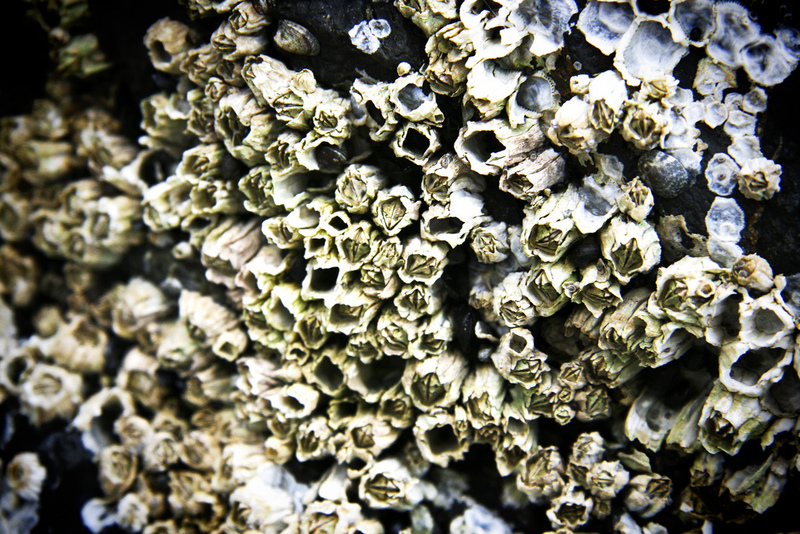 Tide pools are also home to shellfish, such as mussels, limpets and barnacles. Any kid who has ever clambered around on rocky tide pools in flip flops can tell you how viciously a barnacle can cut your foot, if you slip on some slick seaweed! I can not imagine living far from the sea. It’s where I go when I need council, comfort or serenity. Which it to say that I love this month’s Earrings Everyday Tide Pools theme. The earrings I made would be great to wear at the beach. But I know that I’d wear them lots of other times, just to bring a bit of the beach into my everyday life. The beautiful blue lampwork beads are handmade by Sue Kennedy of Sue Beads. There is a lovely trailing of fine silver around these beads, which accents the sterling silver starfish that I dangled below them. This is a blog hop. To see everyone else’s tide pool inspired earrings, head over to Earrings Everyday, to get the links. This entry was posted in Bead And Jewelry Challenges, Jewelry and tagged Art Beads, blog hop, earrings, Earrings Everyday, handmade earrings, lampwork glass, Linda Landig Jewelry, ocean, sea, sea stars, star fish, Sue Beads, tide pools by Linda Landig. Bookmark the permalink. Beautiful earrings! They would be perfect everyday earrings for any beach lover. Utterly versatile! A person could wear these every day from April 1 to September 30. Beautiful! Sue’s lampwork beads are perfect for this inspiration and I love those tiny starfish! The colors of the critters in your fist photo remind me of the tide pools I’ve seen. I’m not lucky enough to live by the ocean, but I am lucky to have visited the coast a few times. Your earrings are a perfect wear every day design. I love that shade of blue paired with the silver starfish. Gorgeous. Beautiful!!! Love the color of the lamp work bead with those adorable starfish! Just perfect. Love the charms and blue beads! Beautiful! Lovely earrings! I always appreciate your jewelry designs! I Thought those looked like Sue Beads, gorgeous pairing! Beautiful! I really love the blue. It is a soothing color. And with the silver, it really accents the star fish. Great Job!